Give your jewelry the display box it deserves! The Berset’s hair-on-hide exterior is paired with a luxe white suede interior and brass accents that make the ivory palette pop. 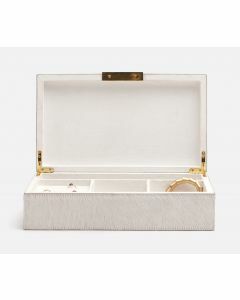 With multiple compartments, including one especially made for rings, this beautiful jewelry box is the perfect place to organize your baubles. This jewelry box measures 9.5"L x 7.5"W x 4"H. Click on images for greater detail.